Imagine a universe where instead of Peter Parker gaining the powers and responsibilities of Spider-Man, his close friend Gwen Stacy is bitten by the radioactive spider and takes to slinging her webs across the skyline of New York City, fighting crime as best she can. This modern take on the Spider-Man mythos does just that, and here at Superheroes Direct, we supply fans of this popular vigilante with a variety of Spider-Gwen collectibles, apparel, and accessories. Our POP figure displays the young heroine in full costume, eyes glowing from underneath her white hood. Our various t-shirts feature Gwen Stacy in different action poses, and she appears alongside other heroes and heroines in our collectible button sets which display stunning graphics pulled straight from the comics. What is better than one web-slinging superhero? You know the answer. A true fan never gets enough of the friendly neighborhood Spidey in whatever shape or form. Enjoy the montage exhibited in the Marvel Spider-Verse Button Set. Ramp up your mornings, and get your day started, with a daily dose of caffeine and some helpful assistance from the Spidey of Earth-65. 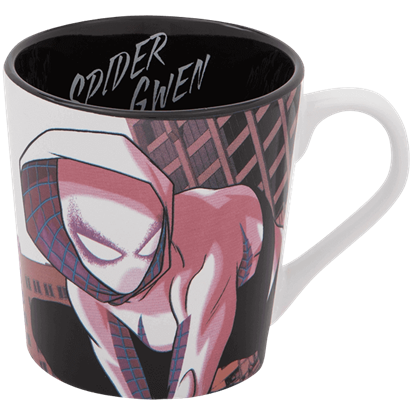 Gwen Stacy watches over New York City in the scenes presented by the Spider-Gwen Ceramic Mug.